In late July, Kyrie Irving stunned us all by asking for a trade out of Cleveland. I, like most people, grabbed my popcorn and happily sat down in front of the internet to watch this drama play out. To me, this was the the first sign of the Cavaliers’ implosion. Considering the Celtics’ position… having just signed Gordon Hayward and having just watched Jayson Tatum have a great summer league… this was going to be delicious schadenfreude. I’d spent weeks brushing off questions of Kyrie’s fit on the Celtics because, to me, it didn’t make sense to give up Isaiah Thomas and other very important assets to basically get a different version of Isaiah Thomas in return. Past performance put serious doubts in my mind. Kyrie, historically, was very prone to dribbling the air out of the ball and playing too much isolation basketball. 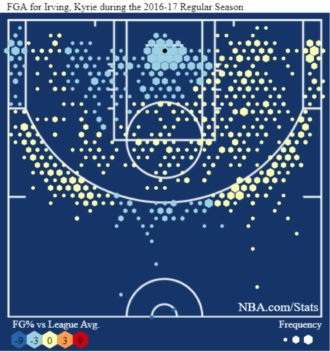 If you look at his shot chart from last year, you see what I saw: a ton of mid-range shots and slightly below average finishing at the rim (mostly because of how highly contested his rim attempts always were). Last season was no aberration. Look at the season before that. The only evidence we have to predict the future is the past, and Kyrie’s past told me this mid-range heavy, ball-dominant, heavily-contested-shot-taking guy would just continue being that. However, there’s a funny thing about athletes in their mid-20’s. A change of scenery, teammates, coaching, and overall infrastructure can have a profound impact on their results. The finishes at the rim are a lot better. The mid-range shots aren’t as dominant. There are well-above league average spots showing up. Part of this is because of the personnel around him. Part of it is the coaching. And part of it is simply because a nearly 26-year-old guy has a lot of room to grow in the NBA, even if he’s one of the league’s most marketable stars. There are a few statistics that highlight the noticeable changes in Irving’s game. Irving is taking more shots without dribbling (and fewer shots after dribbling forever). What that essentially means is he’s getting more catch-and-shoot attempts and layups. Catch-and-shoot jumpers accounted for 14 percent of his offense last year. This year, though, they make up 21.3 percent of his offense. He’s working within the flow of the offense to get open rather than solely relying on his dazzling handles to eventually create a shot. That’s interesting, but his layup statistics are even better, and give us a good glimpse at his new opportunities. The one thing I would say is especially off the ball and his cutting, he has a burst that maybe even coaching against him as many times as we did, we didn’t recognize as easily. His ability especially on back-cuts to set up a cut – and often times he’s going to be overplayed because of who he is, but he has a burst on that initial movement that gets him open that’s pretty special. He never played with a big like Al Horford who can handle the ball and draw attention like that, then make that kind of pass for an open layup. When we first started to explore Kyrie’s potential in Boston, the Al Horford effect was definitely a point of emphasis. One thing that has played out like we thought it might was how Horford’s game has opened up better opportunities at the rim for Irving. The two-man game they’ve developed is already more fruitful for Irving. Last year, LeBron James assisted on 1.3 Kyrie makes per game, followed by Kevin Love assisting on .38. This year, Horford is assisting on 1.5. Kyrie makes, followed by Marcus Smart assisting on .53. In fact, 34.8 percent of Kyrie’s made shots were assisted versus 30.4% last season. Take, for example, this play. The difference between Tristan Thompson and Horford running that play is huge for Irving. If that exact play with that exact personnel in that exact situation plays out with Thompson in Horford’s place, then Tyson Chandler doesn’t take a step toward the three-point line like he does three seconds into this clip. Thompson isn’t a threat from there. If Thompson was in Horford’s place, Chandler would have been in position to cut off the lane, and Kyrie would have taken that mid-range shot from the right side. 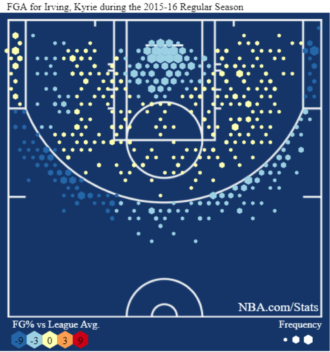 I’ll take a second to let you scroll up and compare shot charts from his Cleveland days to his Boston days again so you can see how many shots from the right side he took before as opposed to what he takes now. Kyrie Irving is cutting more, getting cleaner looks when he gets to the rim, and getting more chances to get shots off without dominating the ball so long that he’s killing the flow of the offense. As a result, he’s shooting better from two-point range than he ever has (54.5 percent this season versus a 49 percent career average). His true-shooting percentage (a metric that adds weight for three pointers and free throws) is over 60 percent for the first time of his career. His player efficiency rating (PER) is higher than ever. 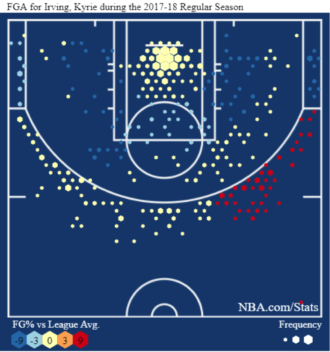 His offensive rating (an estimate of points produced per 100 possessions) is also at a career high. Basically what I’m saying here is that Irving has put people like July-me in my place. My worst fears have not only been assuaged, they’ve been eliminated. Kyrie has come into Boston and, through a combination of his hard work, his new teammates, and his new coaching staff, evolved into a much different player than he was in Cleveland. Irving has evolved as a player, and it’s paying off in a huge way for the Celtics.